Time passed fast ! We are supprised today is 2nd ,Nov! Today is 5℃ at MWC! It is most cold day ever before in this autumn . We will held class of Handcruft 10th,Nov at MWC. 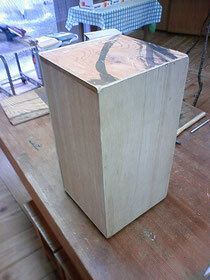 We are plan to make Cajon like photo. Please make a reservation to take a part in the class if you want. 0796-96-1388 or 0796-96-1390(Fax) these Number just Japanese area. If you want check Cajon. We up-load to youtube ,sample made.you can check sounds.